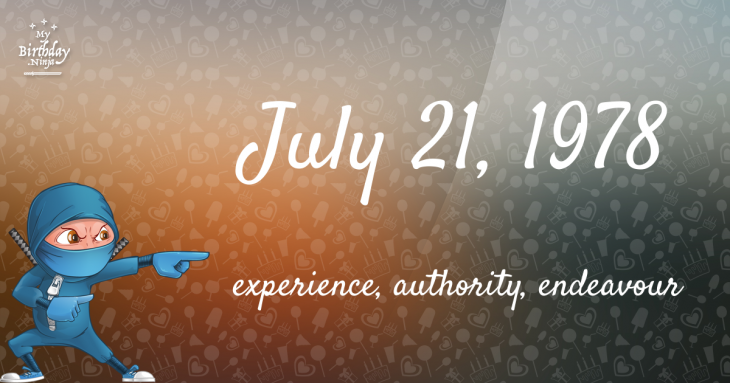 Here are some snazzy birthday facts about 21st of July 1978 that no one tells you about. Don’t wait a minute longer and jump in using the content links below. Average read time of 10 minutes. Enjoy! What day was my birthday Jul 21, 1978? July 21, 1978 was a Friday and it was the 202nd day of the year 1978. It was the 29th Friday of that year. The next time you can reuse your old 1978 calendar will be in 2023. Both calendars will be exactly the same! This is assuming you are not interested in the dates for Easter and other irregular holidays that are based on a lunisolar calendar. 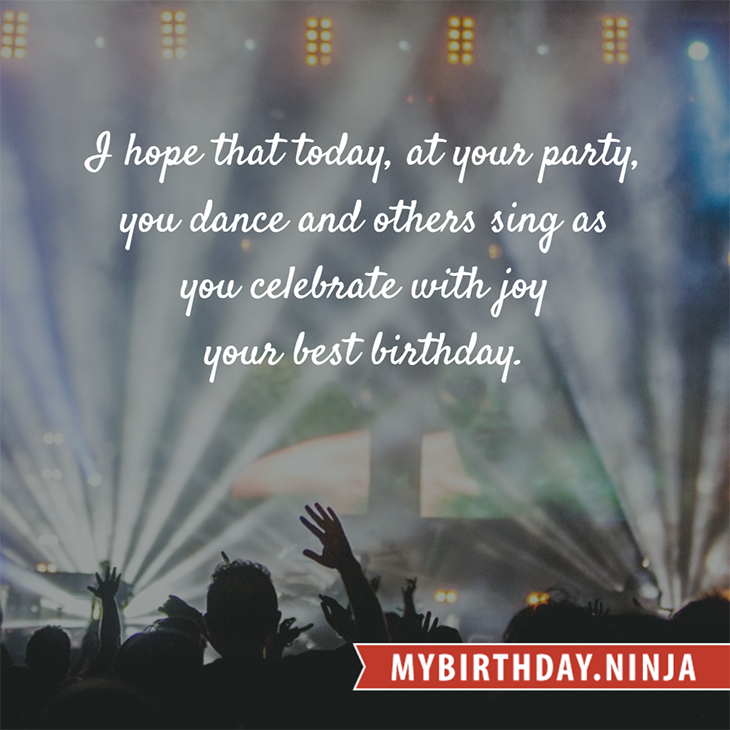 There are 91 days left before your next birthday. You will be 41 years old when that day comes. There have been 14,884 days from the day you were born up to today. If you’ve been sleeping 8 hours daily since birth, then you have slept a total of 4,961 days or 13.58 years. You spent 33% of your life sleeping. Since night and day always follow each other, there were precisely 504 full moons after you were born up to this day. How many of them did you see? The next full moon that you can see will be on May 18 at 21:13:00 GMT – Saturday. Fun stat: Your first one billion seconds (1,000,000,000) happened sometime on March 29, 2010. If a dog named Scallop - a Maltipoo breed, was born on the same date as you then it will be 180 dog years old today. A dog’s first human year is equal to 15 dog years. Dogs age differently depending on breed and size. When you reach the age of 6 Scallop will be 40 dog years old. From that point forward a small-sized dog like Scallop will age 4 dog years for every human year. The first landing of French troops on the coast of the Isle of Wight during the French invasion of the Isle of Wight. Eighty Years’ War: Battle of Jemmingen: Fernando Álvarez de Toledo, Duke of Alva defeats Louis of Nassau. The Raid on Málaga takes place during the Anglo-Spanish War. Russo-Turkish War (1768–74): Russia and the Ottoman Empire sign the Treaty of Küçük Kaynarca ending the war. At Adair, Iowa, Jesse James and the James–Younger Gang pull off the first successful train robbery in the American Old West. Sir Malcolm Campbell, father of Donald Campbell, becomes the first man to break the 150 mph land barrier at Pendine Sands in Wales. He drove a Sunbeam at a two-way average speed of 150.33 mph. Mercury program: Mercury-Redstone 4 Mission: Gus Grissom piloting Liberty Bell 7 becomes the second American to go into space (in a suborbital mission). What does my birthday July 21, 1978 mean? Your birthday numbers 7, 21, and 1978 reveal that your Life Path number is 8. It represents experience, authority and endeavour. You are gifted with natural leadership and the capacity to accumulate great wealth. The following celebrities also have the same life path number: John Wilkes Booth, Nancy Reagan, Steven Fischer, Nicholas Hammond, Gonzalo Olave, John Hartford, Avicii, Floyd Red Crow Westerman, Alexis Bledel, Troye Sivan. What is the birthday horoscope for Jul 21, 1978? The Western zodiac or sun sign of a person born on July 21 is Cancer ♋ (The Crab) – a cardinal sign with Water as Western element. The ruling planet is Moon – the celestial body of moods and emotions. According to the ancient art of Chinese astrology (or Eastern zodiac), Horse is the mythical animal and Earth is the Eastern element of a person born on July 21, 1978. Fun fact: The birth flower for 21st July 1978 is Larkspur for haughtiness. What is the Love Match for Jul 21, 1978? When it comes to love and relationship, you are most compatible with a person born on October 14, 1987. You have a Love Match compatibility score of +92. Imagine being in love with your soul mate. On the negative side, you are most incompatible with a person born on February 19, 1994. Your incompatibility score is -140. You’ll be like a cat and a dog on a love-hate relationship. Arf-arf, I want to bite you. Meow-meow, stay away from me! The number-one hit song in the U.S. at the day of your birth was Shadow Dancing by Andy Gibb as compiled by Billboard Hot 100 (July 22, 1978). Ask your parents if they know this popular song. How many babies were born on July 21, 1978? Base on the data published by the United Nations Population Division, an estimated 122,638,528 babies were born throughout the world in the year 1978. The estimated number of babies born on 21st July 1978 is 335,996. That’s equivalent to 233 babies every minute. Try to imagine if all of them are crying at the same time. What is the popular baby name on 21 Jul 1978? Here’s a quick list of all the fun birthday facts about July 21, 1978. Celebrities, famous birthdays, historical events, and past life were excluded. Try another birth date of someone you know or try the birthday of these celebrities: March 21, 1981 – Aysun Kayacı, Turkish model and actress; March 27, 1907 – Mary Treen, American actress and singer (d. 1989); November 5, 1976 – Jeff Klein, American singer-songwriter and guitarist (My Jerusalem, The Twilight Singers, and The Gutter Twins).